Undeniably, Autism Speaks is the most visible autism organization out there. It's light it up blue campaign is EVERWHERE. Just Saturday night my brother in laws girlfriend told me she made a donation to AS at our local store and put Dominic's name on the wall. For the rest of you, please don't. Please. If you want to support an Autism organization this month, Support Alpine Autism Center (see the fundraiser widget in my sidebar) - I can vouch they are actually doing good work for Autistic kids and families. They kept us sane the years we were there. Or support TACA, Generation Rescue, or one of the other organizations ACTUALLY helping families. According to their own IRS 990 form, Autism Speaks "funds research" and "raises awareness". They spent $79k of their $56million spent in 2011 helping families with an autism dependent who were in dire financial need (hello, thats all of us). The vast majority of their money goes to their salaries and benefits ($36.6MILLION). Can you do it without listening to the garbage from an ever floundering CDC trying to "prove" there's no related between vaccines and autism? 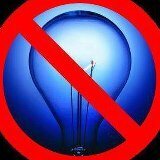 Anyway - take the $2 you would spend on a blue lightbulb, and do something else with it. Its time to Act.